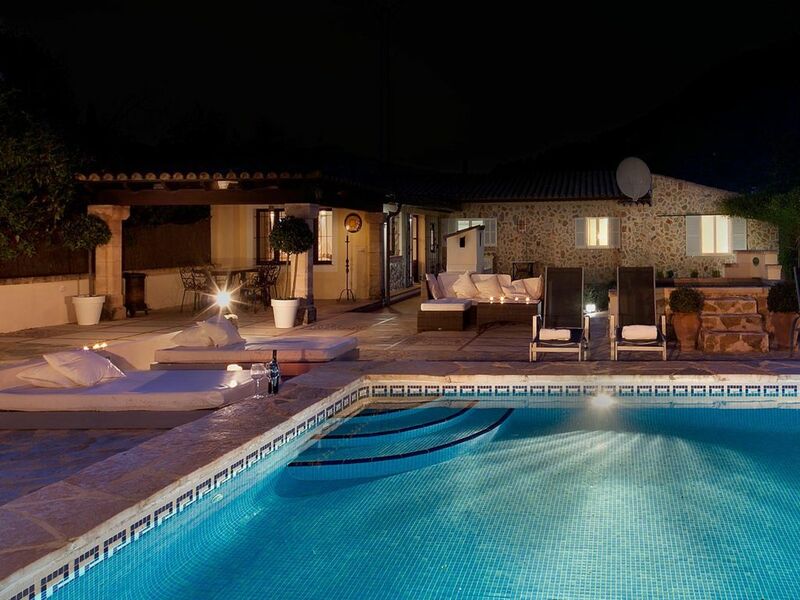 Luxury 4 Bedroom, 5 Bathroom Town House with Sea View and a Private Heated Swimming Pool , Air Conditioning, WiFi, Satellite TV, near Golf, Sleeps a maximum of 8 people. 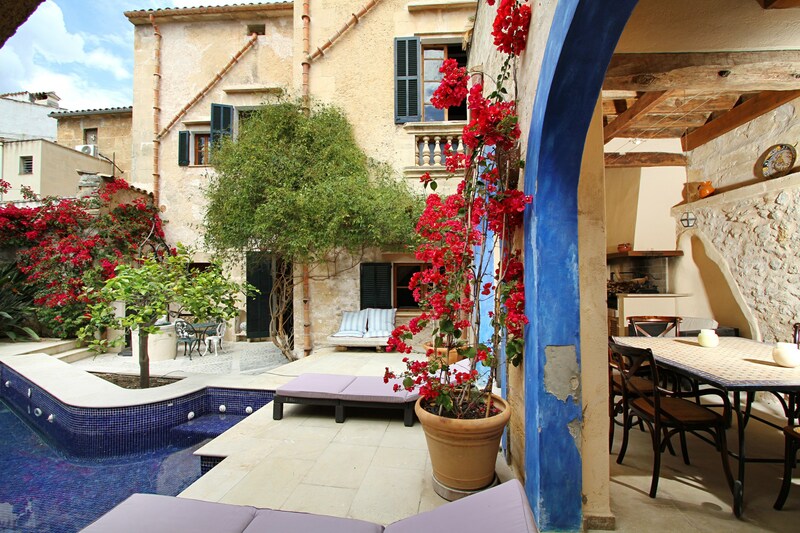 Maison Mallorca is elegance personified. 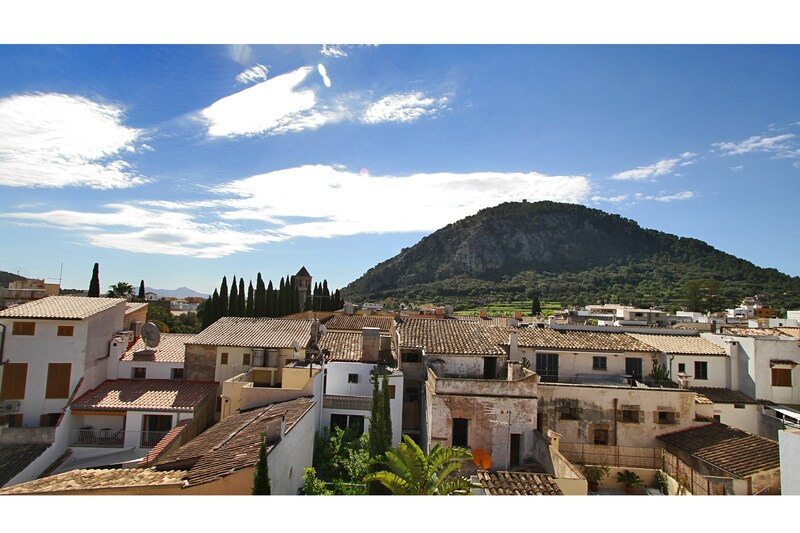 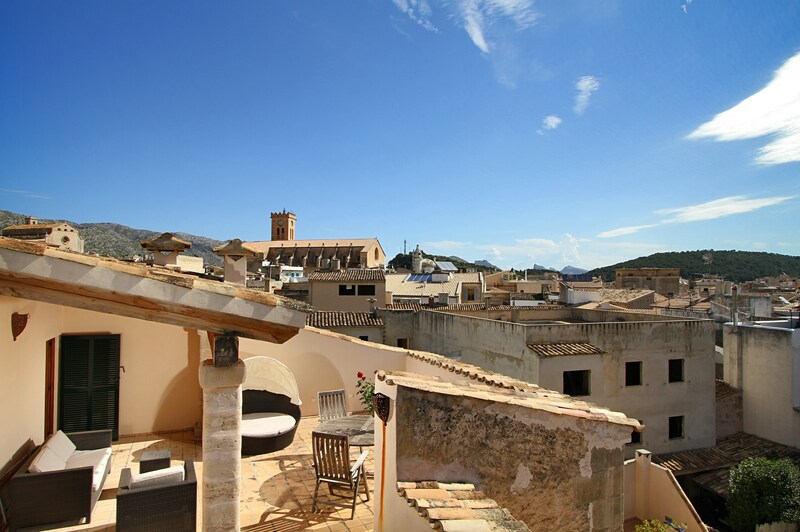 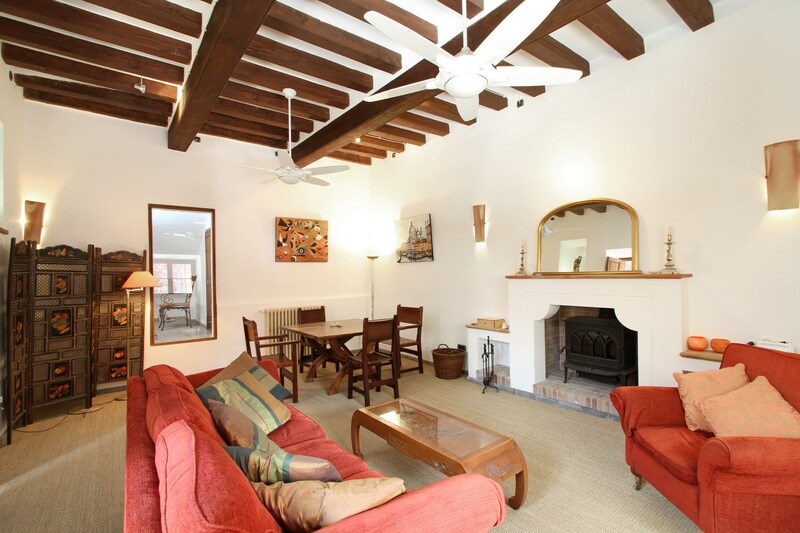 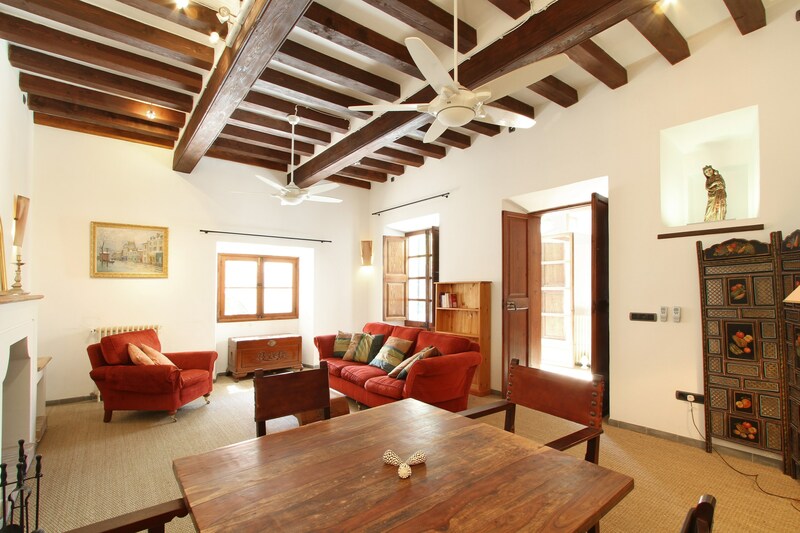 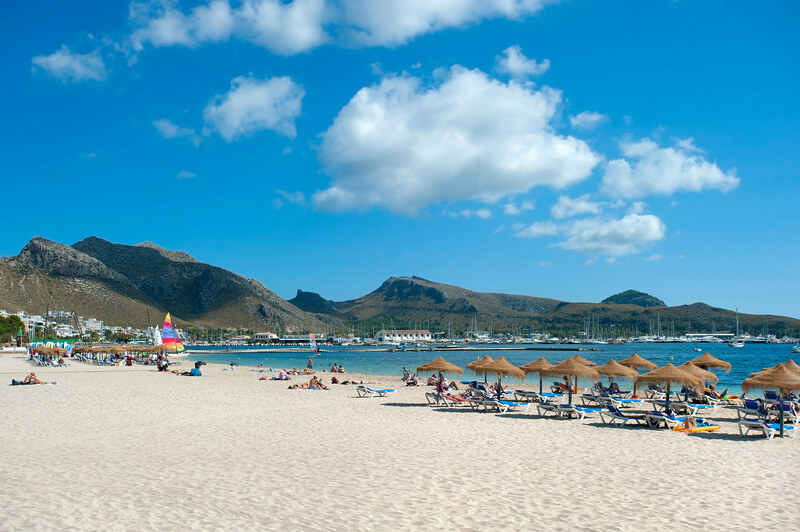 If you’re looking to spend a holiday in a beautiful traditional Spanish townhouse just a stone’s throw away from all the main attractions historic Pollensa has to offer, you’ve found it at Maison Mallorca. 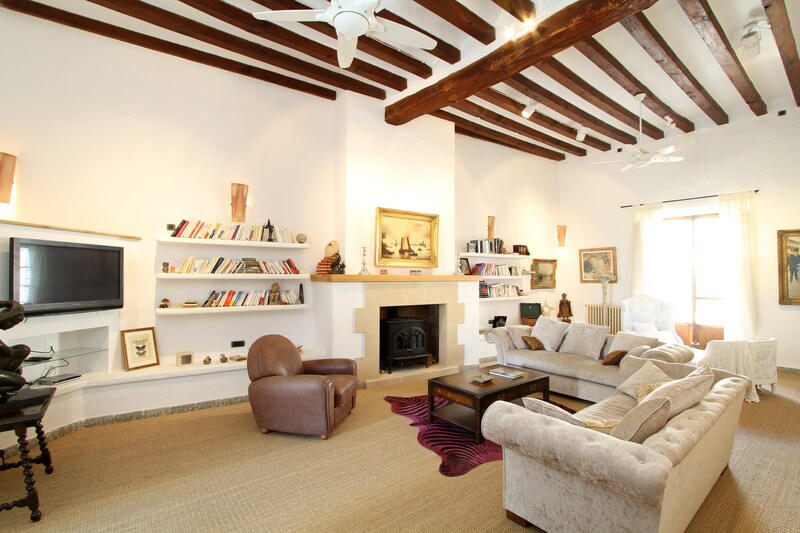 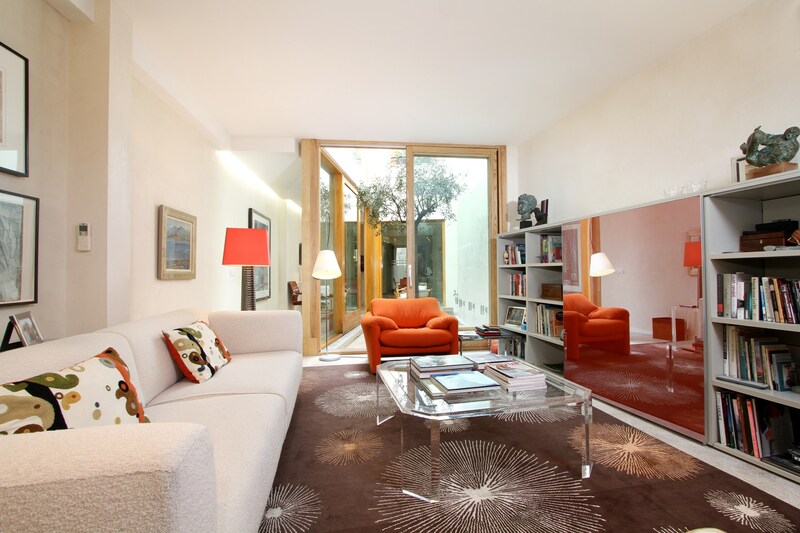 Almost immediately you can tell that the owner of this superbly renovated property loves art. 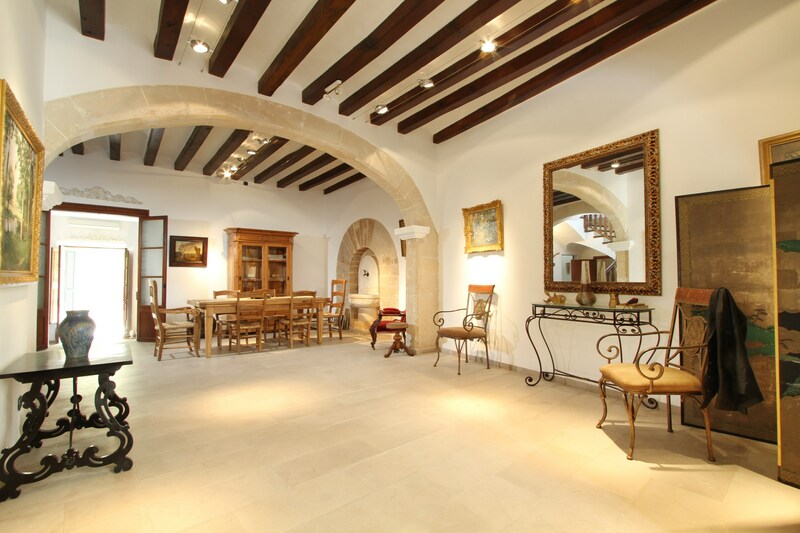 In fact, in addition to a collection of lovely artworks dotted throughout the mansion, you’ll find some splendid original paintings from his private collection. 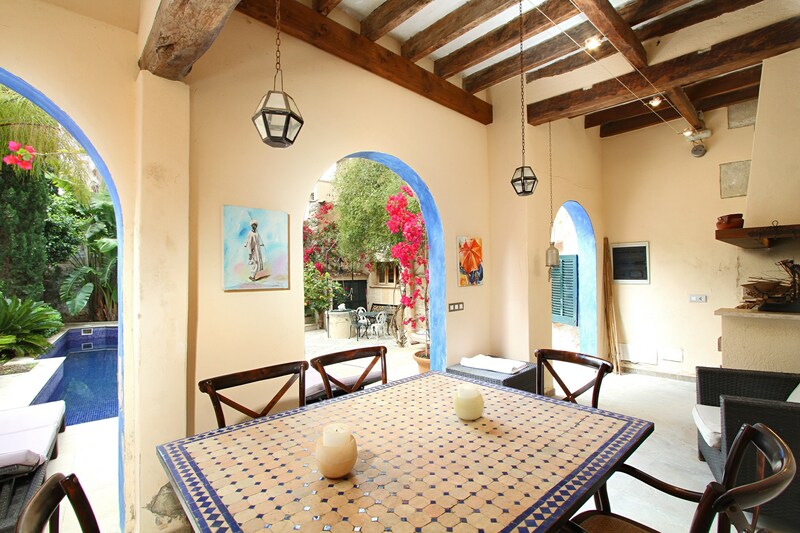 So let’s make our way inside. 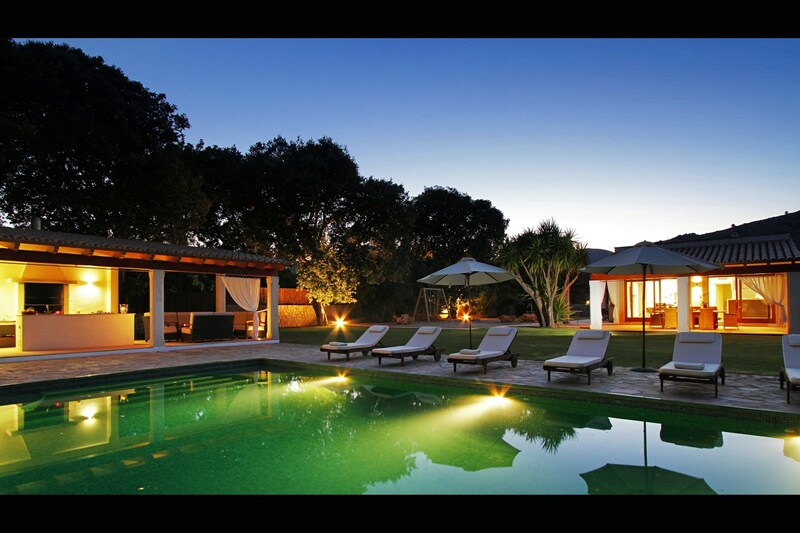 When it comes to entrances, you don’t get much better than this. 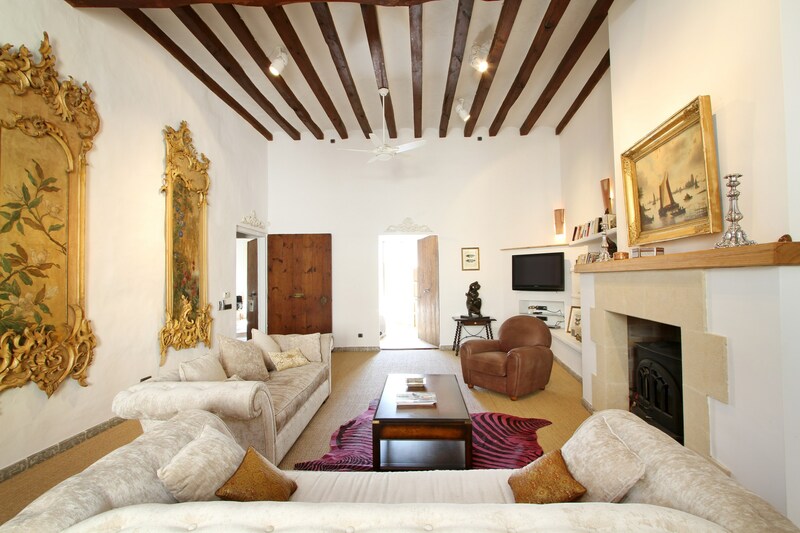 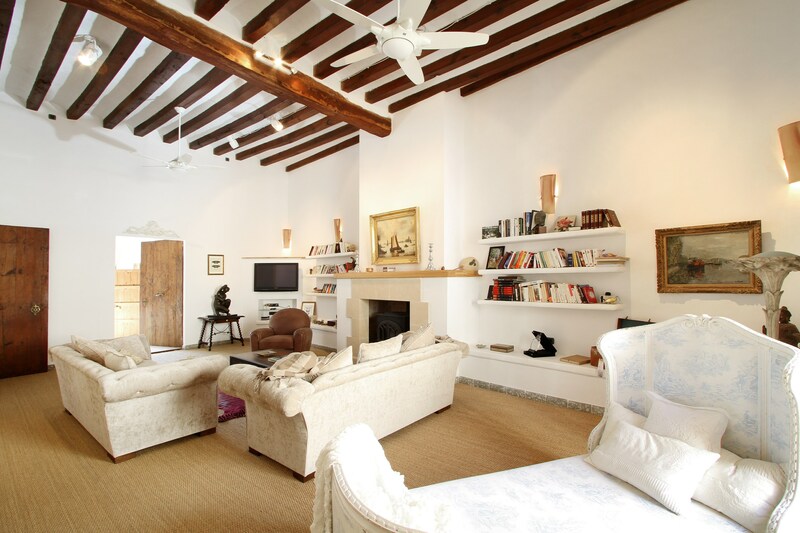 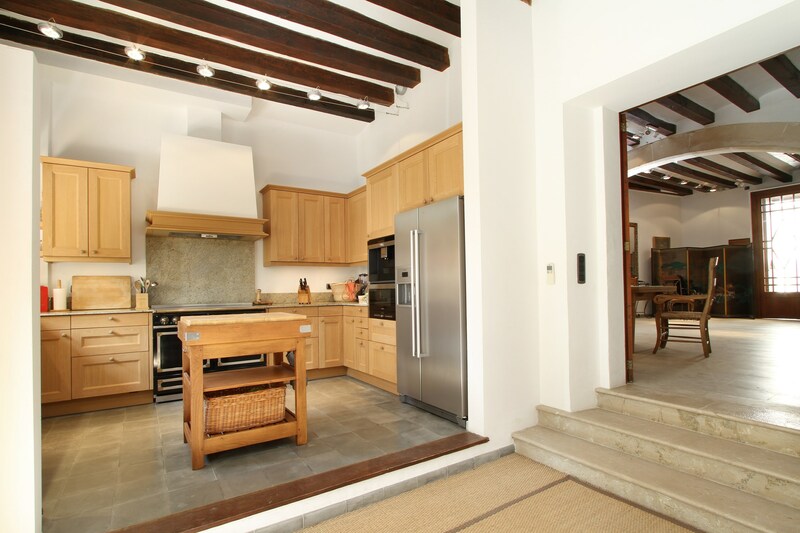 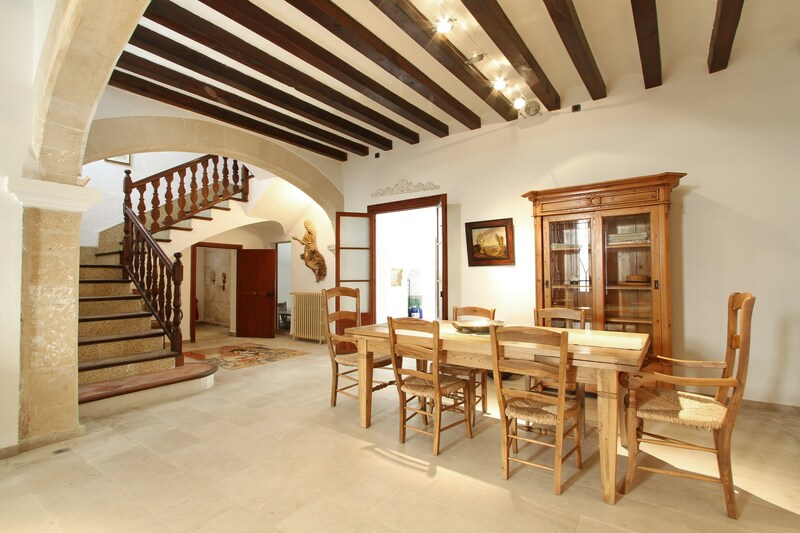 The entrance hall is huge in true Spanish tradition, the high ceilings adorned by solid wood roof beams. 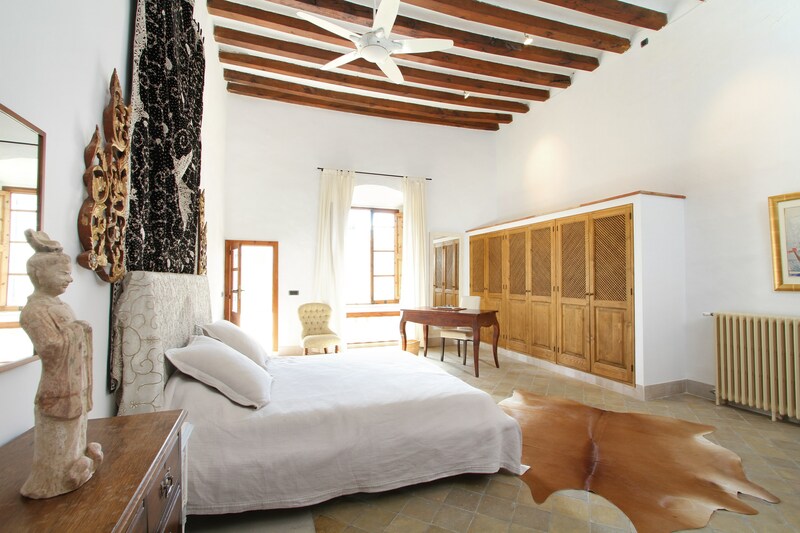 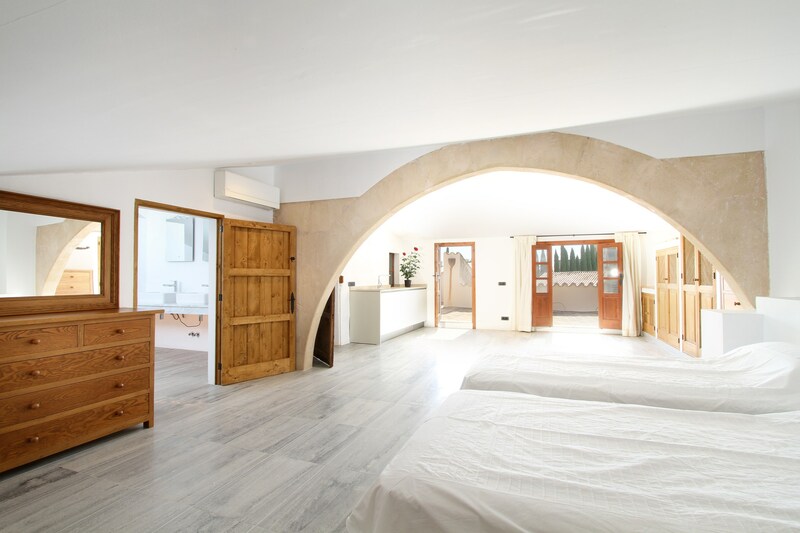 Appreciate those thick stone walls, admire the gorgeous ceramic floors, marvel at that grand stone archway, check out the lovely antiques…it’s all rather special here at your Mallorcan holiday home. 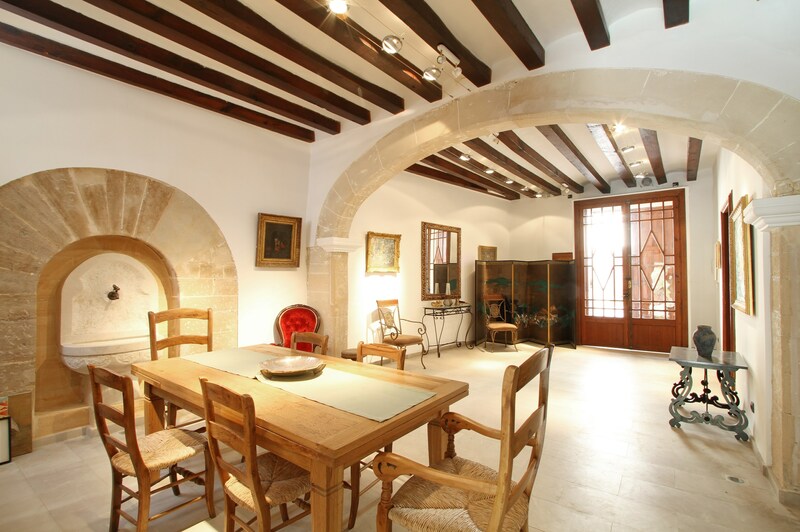 One of the first things you notice as you pass through the entrance hall is a lovely dining area featuring a completely restored stone fountain as its centerpiece. 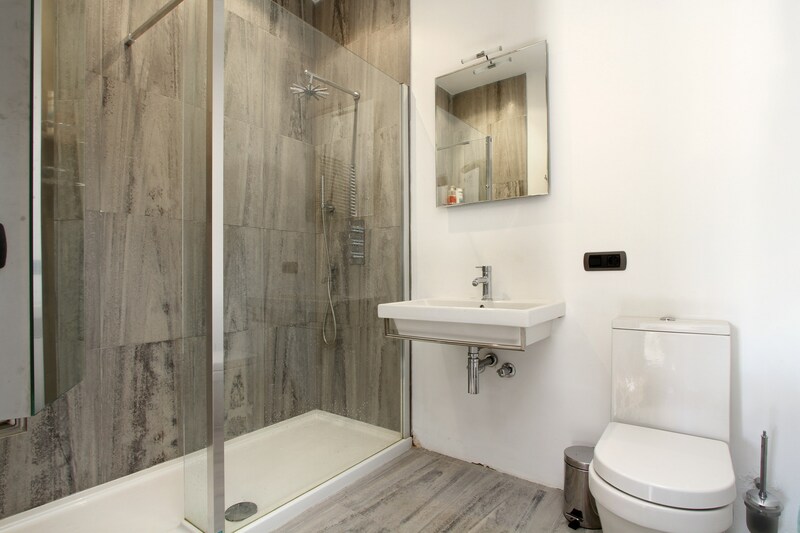 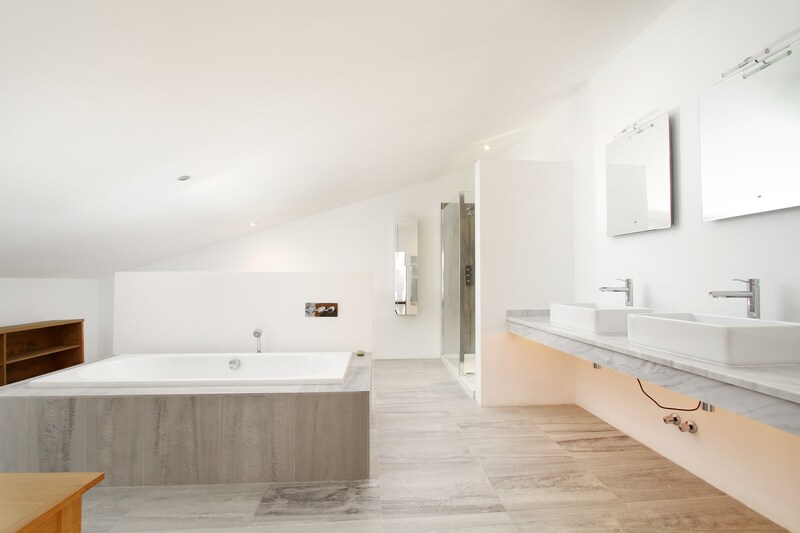 You’ll find a gorgeous bathroom complete with Italianate fixtures on this level too, as well as a state of the art kitchen fully-fitted with all the mod cons you will need, including a large American-style fridge-freezer. 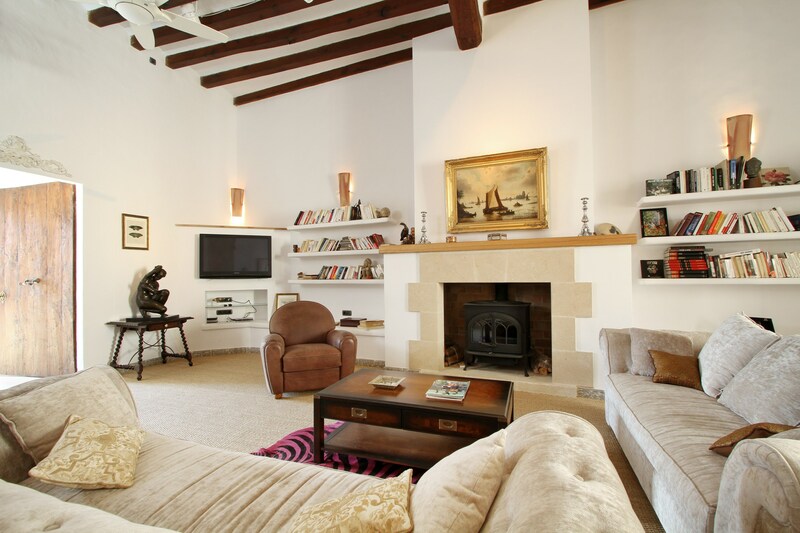 Large cosy sofas invite you to put your feet up and catch up on your favourite programmes on the plasma TV mounted on the wall. 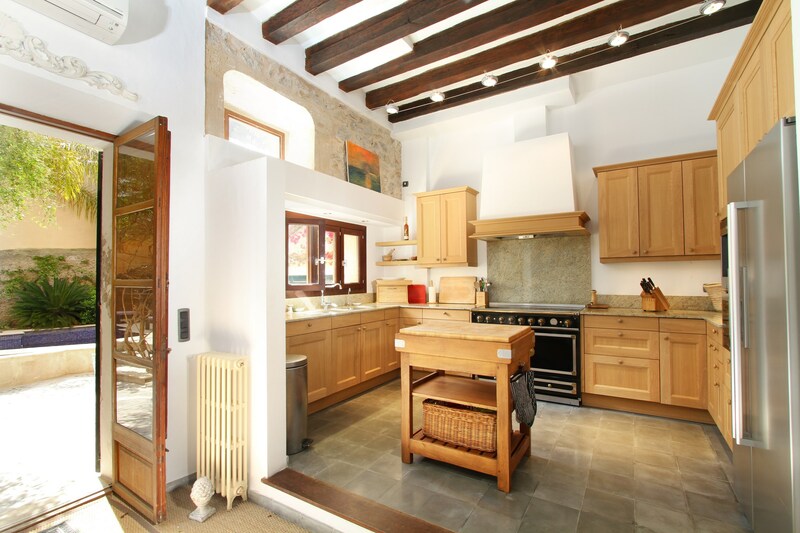 And if you’re enjoying a touch of winter sun on your holiday, the wood-burning stone will keep you as warm as toast in the evenings. 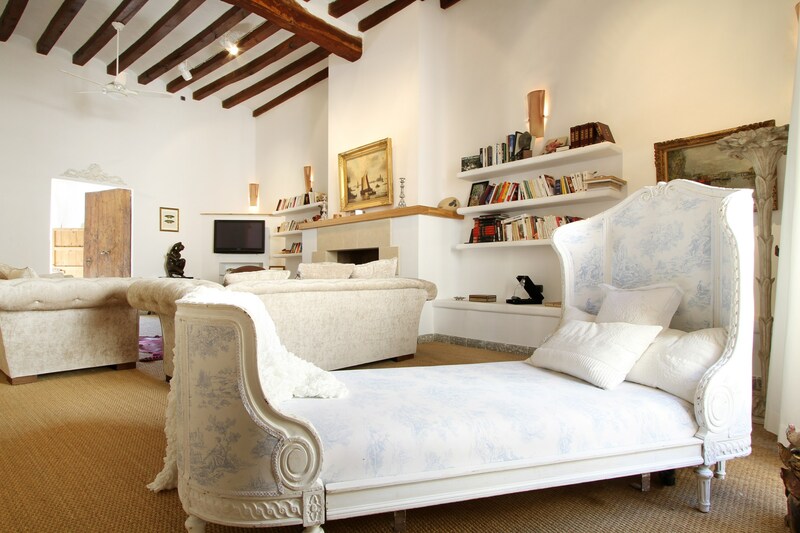 Off from the lounge you’ll find two well-appointed double bedrooms, both with en suite bathrooms. 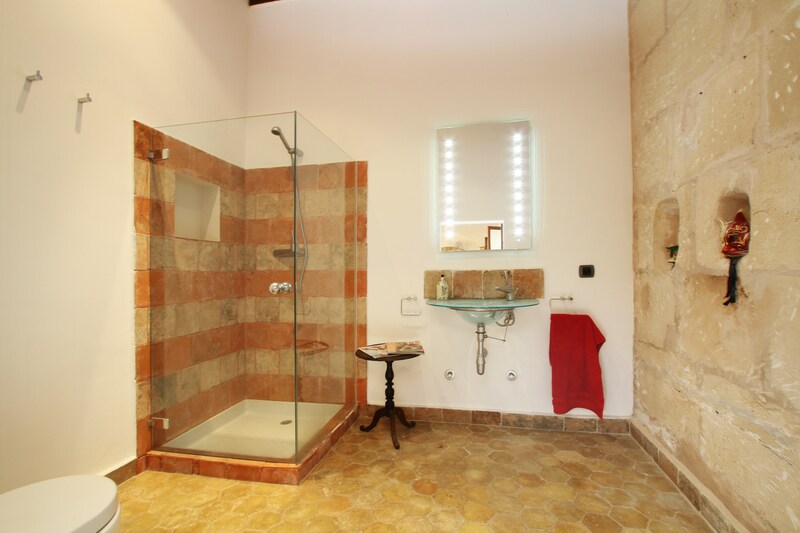 The property’s master double bedroom with en suite shower room is also on this level. 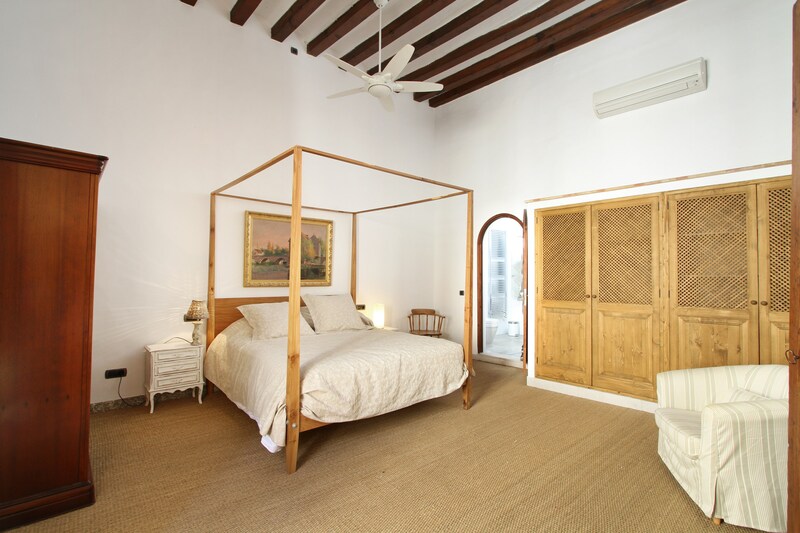 Open up the wooden window shutters and you are greeted with the most picturesque of views. 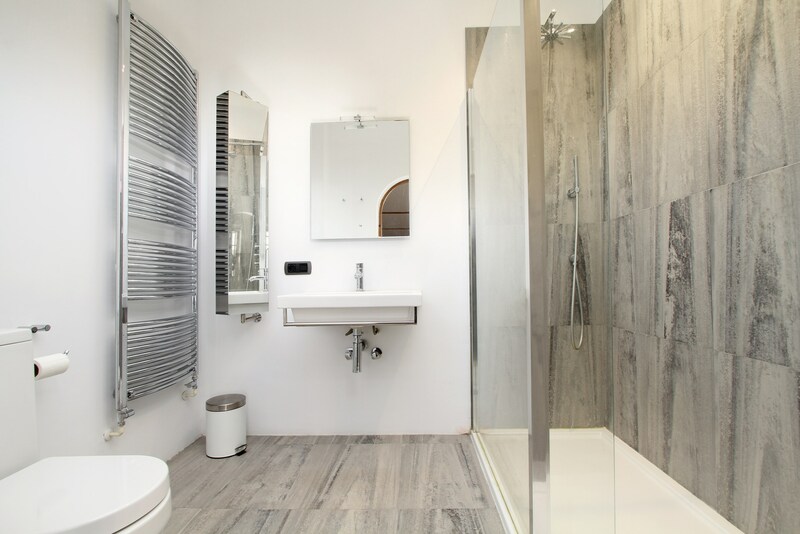 Up on the second floor you’ll find a roomy twin-bedded studio/apartment complete with ample wardrobe space and a large en suite bathroom and small kitchenette. 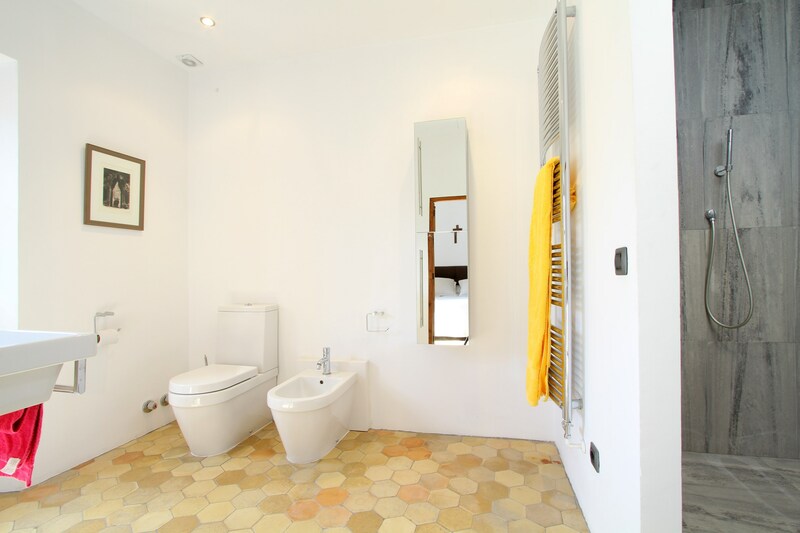 This provides the utmost privacy for guests. 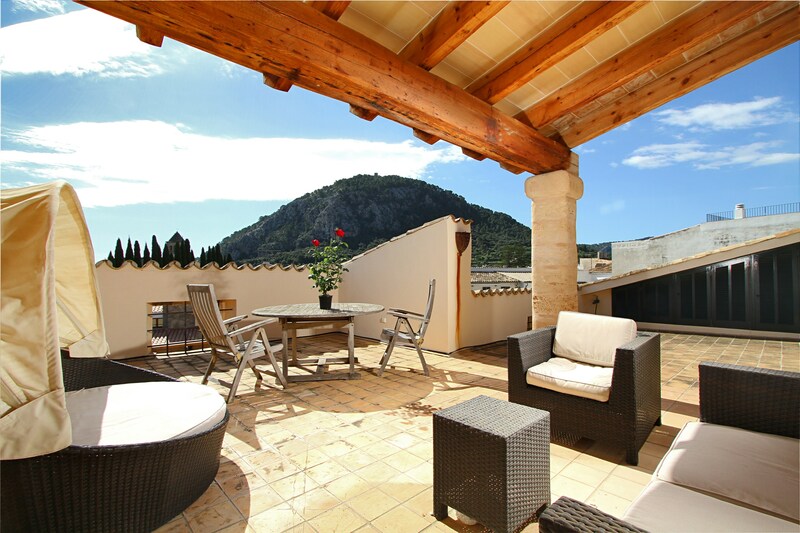 And then there’s the amazing furnished roof terrace – what a fabulous view over the pretty rooftops of Pollensa and the mountains beyond! 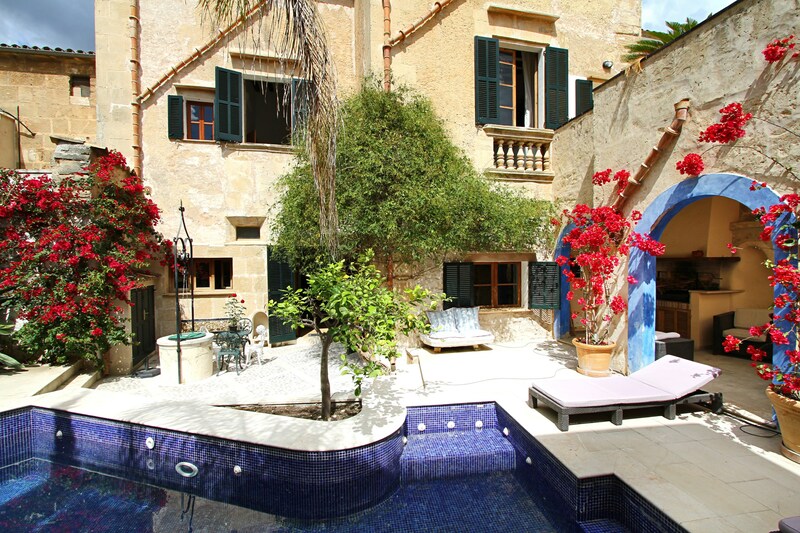 The exterior of Maison Mallorca is just as impressive. 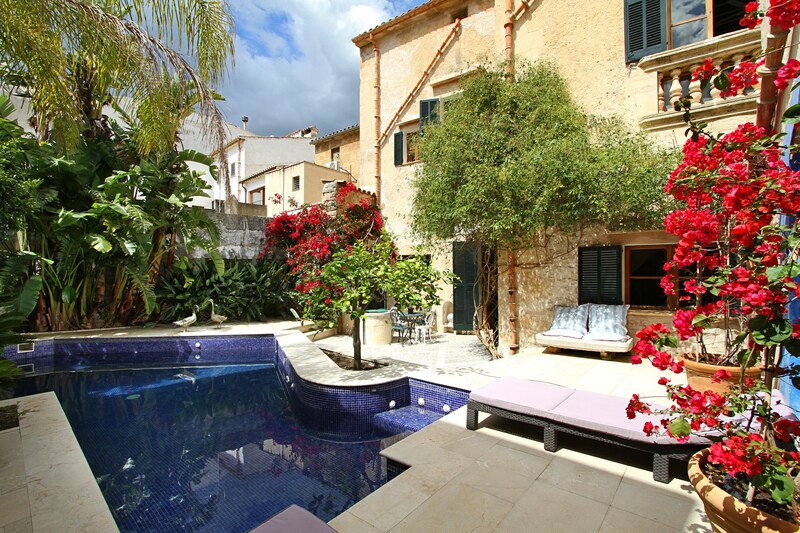 The star attraction here is undoubtedly the deep blue, heated swimming pool (9mx4m, depth 0.5m to 1.9m), a haven of peace and privacy right in the centre of town. 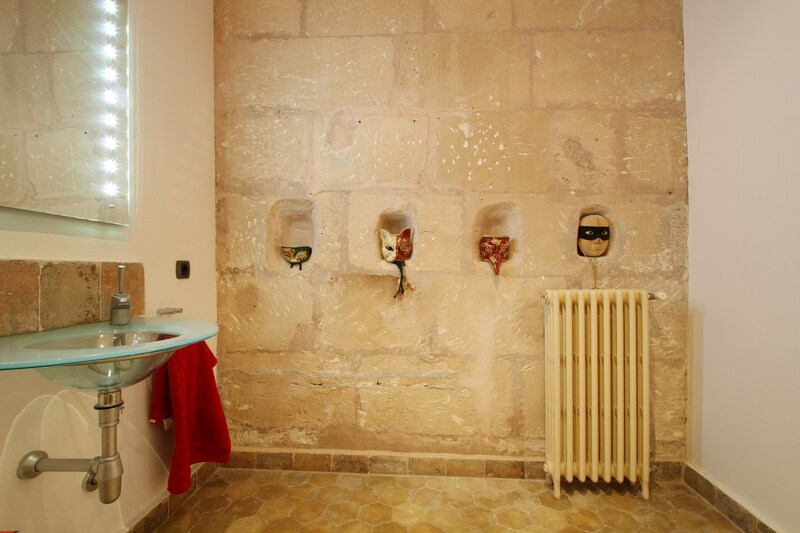 A large garage can be accessed from the main hallway and, should you fancy exploring the area on two wheels, there are four bicycles which you are welcome to use. 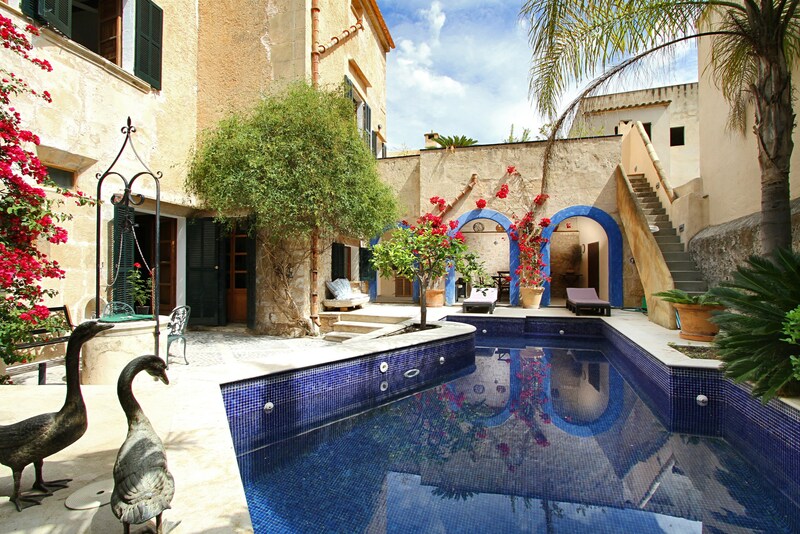 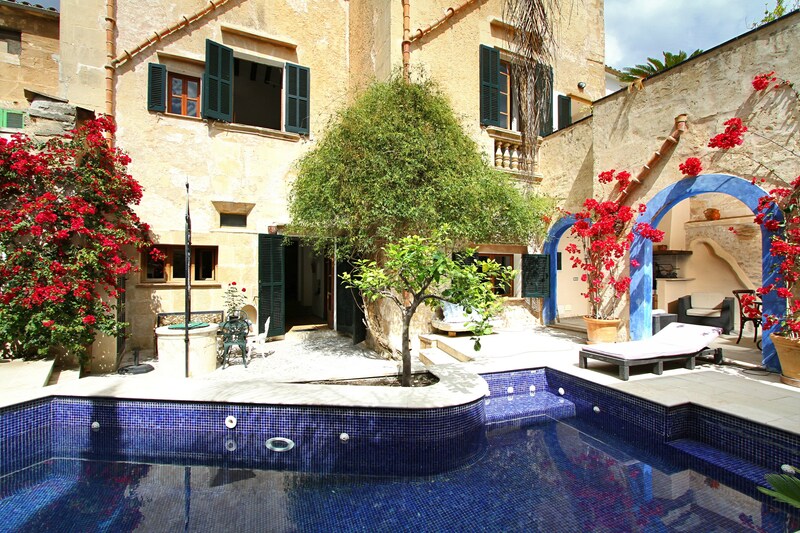 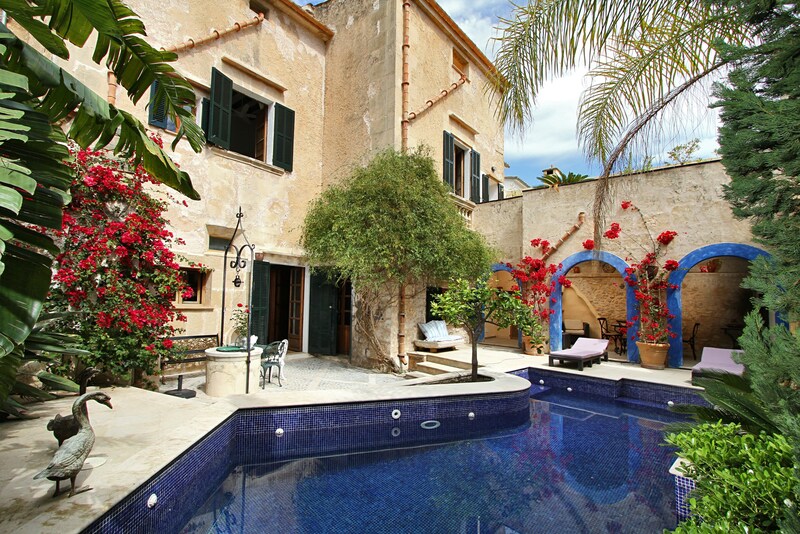 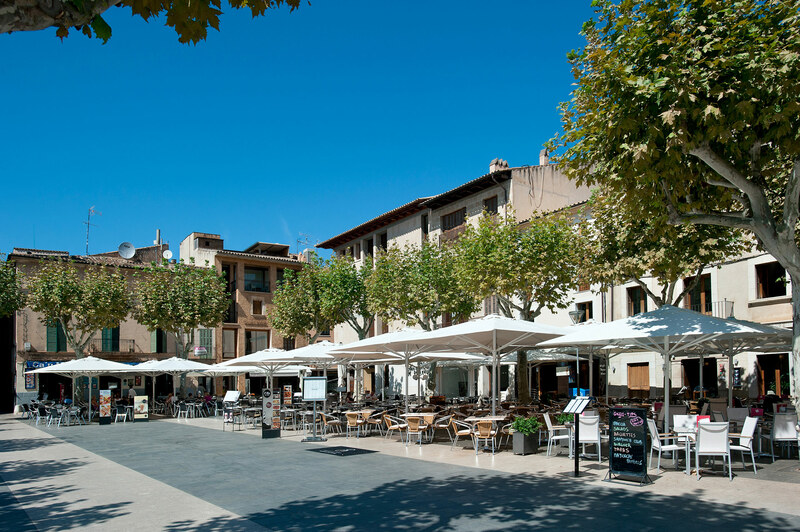 And all this right in the heart of one of Mallorca’s most beautiful old towns!